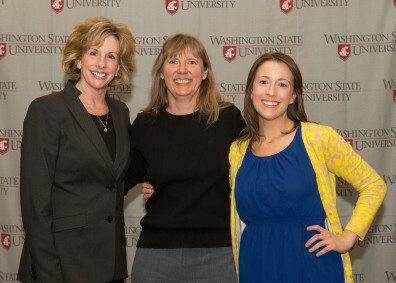 Executive Director for the Washington State Criminal Justice Training Commission Susan Rahr, Faith Lutze, and Amber Morczek. Nominated by Dr. Faith Lutze, Ph.D. student Amber Morczek won this year’s Karen P. DePauw Leadership award. Morczek is a graduate assistant in Violence Prevention Programs in the Health and Wellness Center, where she trains bystanders of potentially violent situations how to take effective action. She was also a driving force behind the Prison Debate Project, which is discussed in detail in a previous edition of our newsletter. Additionally, Morczek has worked as a sexual health educator for the WSU Voices for Planned Parenthood and is currently serving as a graduate advisor for the President’s Commission on the Status of Women. The Karen P. DePauw Leadership award was established in 2003 to provide support for women graduate students who demonstrate evidence of exceptional leadership skills and university involvement at WSU and are working on completing their dissertations. It was created in honor of DePauw’s 22 years of work at WSU, where she was a professor in the Sociology Department, as well as the Human Nutrition, Foods, and Exercise Department. Following that, she was Associate Dean, Interim Dean, and finally Dean of the Graduate School.